Novak Djokovic's US Open victory has catapulted him back into the Top 3 of men's tennis. 6-3 victory under the roof at Arthur Ashe stadium - it was raining in NY - pulled him level with Pete Sampras for third on the all-time men's list. He almost quit tennis in 2015, after four wrist surgeries that wouldn't let him regain the form that carried him past Roger Federer to win the 2009 U.S. Open. Djokovic's strength lay in his returns. We reached the top after three hours. On the other hand, Del Potro was relying heavily on his serves and power. Yet the atmosphere was more positive on Sunday as spectators enjoyed an absorbing contest - again played under the roof of Arthur Ashe Stadium due to rain - between two great friends. That inspired me to start playing tennis. Throughout the tournament, the two struggled and rose above New York's searing heat and hard humidity. He made one last stand by breaking and holding for 3-all. From there Djokovic comfortably served out the set. Djokovic, up a set, was serving at 3-4 when the two proceeded to play 23 points. The tournament, meanwhile, set a new attendance record of 828,798 fans through the gates at Flushing Meadows. Djokovic occasionally seemed annoyed by the support with the noise as British umpire Alison Hughes had to constantly plead with the crowd to remain quiet during points. Things looked ominous for Del Potro as Djokovic seized control early on, moving magnificently and constructing a number of superb points with precision striking. Twice, the Serb tried to attack at the net. After taking just two points off Del Potro's first three service games, Djokovic pounced to break for 5-3. 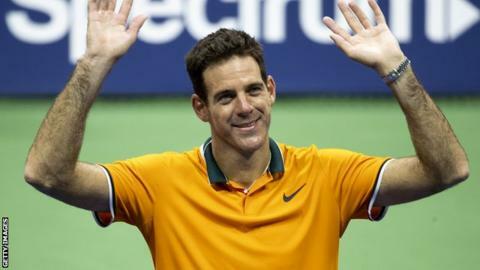 In the tiebreak, Del Potro looked susceptible to forehand errors and Djokovic showed vast courage and quality to take it away from Del Potro, going up 2-0 in the final. What was different was that the quality of tennis only kept getting better. All that frustration was washed away when he struck the overhead victor to clinch victory over Del Potro, Djokovic falling to his back, arms and legs spread savouring the moment. This was Djokovic's third championship in NY, along with those in 2011 and 2015.